We started the day with slight drizzle but by about 10.30 the day was beginning to brighten up and by late morning it was quite warm. Allan was there to offer tips and advice on hunting. 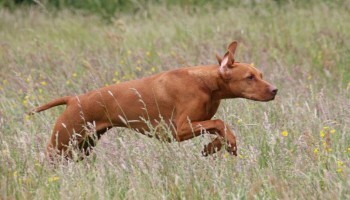 The grass was quite long and we had a very pleasant breeze, the handlers were asked to send their dog off to quarter the ground and find the first caged Quail, all dogs either indicated or pointed the game. 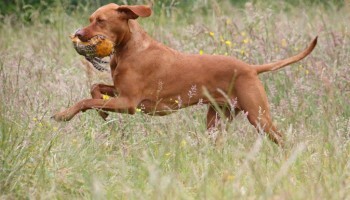 The dog was then sent out to hunt for the second caged quail, again all dogs found it. Some dogs pointed for the first time which is always quite a thrill for the handler. We then moved on to the ground scenting, we usually train our dogs to air scent but if a bird had been shot and wounded it would run along the ground leaving ground scent and the dog would be sent to find it. Sue had laid a trail of Pheasant blood leading to a dead bird….it was great to see the dogs picking up the ground scent and quickly following it along the track. Some dogs were happy to pick the bird up and return it to the handler others just sniffed around it but all found the bird. Next was the retrieve using wing covered dummies, some dogs were not too happy to pick these up so a normal dummy was thrown for the retrieve with Andy giving advice on perfecting the retrieve and delivering the dummy to hand . About 1pm we stopped for lunch and cakes, biscuits and cold drinks supplied by HVC. After lunch we went down to the water, a couple of the dogs had not been in the water before but were encouraged in by Andy and handler getting into the shallow water and enticing the dog in with a dummy…great to see the first water entry. Downstream there was an area for more experienced dogs to either retrieve from the flowing river or to get over onto the other bank to retrieve. Allan was finishing the hunting and then along with Sue they set up cold game retrieving, all of the dogs went for the retrieve but not all would pick up the cold game. The day finished about 4pm there were some tired looking handlers and dogs but hopefully everyone enjoyed the day. We had a great training day 27 April with Allan Hender. 26 people attended with dogs of various ability. The weather was kind to us and hopefully everyone enjoyed the day. We had hunting and pointing live caged Quail , blood tracking, various retrieves and water retrieves and lots of advise from very experienced trainers. 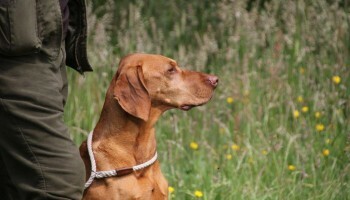 On a warm, sunny April morning, mum, I and our beautiful Vizsla ‘Ceris’ aka Alsziv Wild Cherry set off for the HVC Gundog Training Day in Berkshire. Having never been to a Gundog training day before I was feeling pretty tentative, and on the journey found myself thinking if we would be the only novices, at what point would I embarrass myself and would I let my dog down. We and 25 other Gundogs, namely Vizslak, GSP’s, Munsterlanders and a Wire Haired Vizsla and their owners gathered round, listening intently to Allan Hender and his team explain the disciplines for the day. It soon became clear there was nothing to worry about as we would get as much help as we needed and we and our canine friends were to have fun. We were told to start where we felt most comfortable, so Ceris and I trotted off to the retrieve for beginners. Those who were more experienced started at the other areas; the advanced retrieve, quartering and pointing with live quail, following the blood trail, blind retrieve or water retrieve. As the day progressed everyone was having a fantastic time. Allan and his team were very knowledgable and helpful and we were all given ample time to try every discipline, getting lots of individual and group hints and tips on how to improve and what to try differently next time. 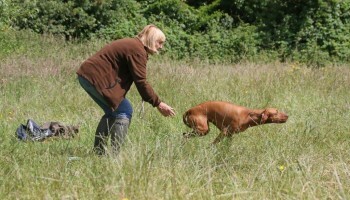 It was great to see so many lovely dogs enjoying doing what comes naturally to them. 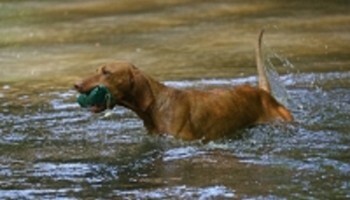 As for Ceris and I, we tried every discipline while I watched in amazement as my ginger friends instincts came to the forefront as she retrieved, swam in a river with what could be classed as an advanced entry, followed the blood trail and pointed gently at quail. If you have ever thought about trying Gundog training but are worried about what to do or that you are a novice, don’t be. 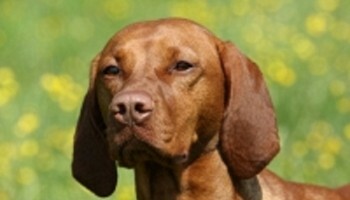 The day was thoroughly enjoyable, and most importantly your Vizsla will be in their element!